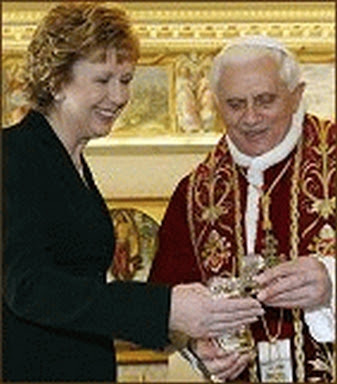 President Mary McAleese said that a visit by Pope Benedict XVI to Ireland would be "very welcome". She was speaking in Rome following a consistory marking the elevation of 23 new cardinals, including Ireland's Cardinal Sean Brady. There has been strong speculation that Pope Benedict may visit Northern Ireland, possibly with a simultaneous visit by Britain's Queen Elizabeth. 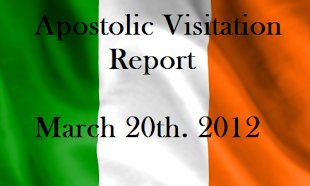 The Irish Times reported in October 2006, during the Irish Catholic bishops' ad limina (obligatory) visit to Rome that British government representatives there were investigating the possibility of a simultaneous visit to the North by the pope and the queen. Sources had confirmed in Rome that it was understood preliminary enquiries had been taking place there about the feasibility of such a visit, which was being presented as a culmination to the Northern peace process. Last month, Taoiseach Bertie Ahern said he believed Queen Elizabeth will pay a formal visit to the Republic. Mr Ahern said he had no knowledge of a mooted visit by Pope Benedict XVI to Ireland. But he added: "Obviously, we would welcome a papal visit." Following the announcement last month that Archbishop Sean Brady was to be made a cardinal, Archbishop Diarmuid Martin of Dublin said the move was a "sign of the interest of Benedict XVI to come to Northern Ireland, if not in the immediate future". In a lecture at the Irish Institute in New York University, Dr Martin said: "Such a visit, alongside one of Queen Elizabeth to Dublin, would have the symbolic meaning of ending an era of our history and opening to something new, North and South."